It's my birthday today, so I took the day off, and look what arrived in the afternoon mail: a Pelta! I ordered it nearly a month ago. Great timing! 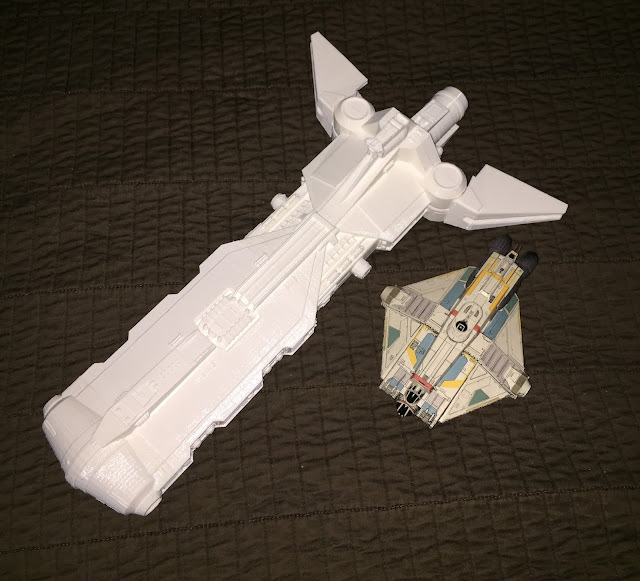 She's even larger than the largest rebel epic ship and a nearly solid hunk of 3D printed material. Detail isn't as high as an FFG model, sadly, but there's enough on there to look good. 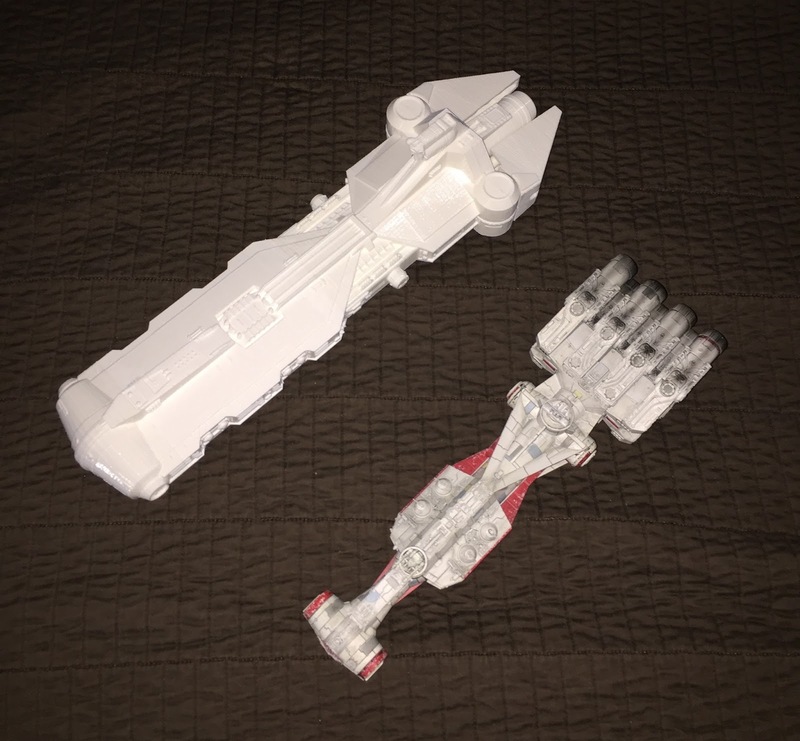 Also, she's a Clone Wars era ship, not the Home One mod with the A-Wing bay from Rebels. 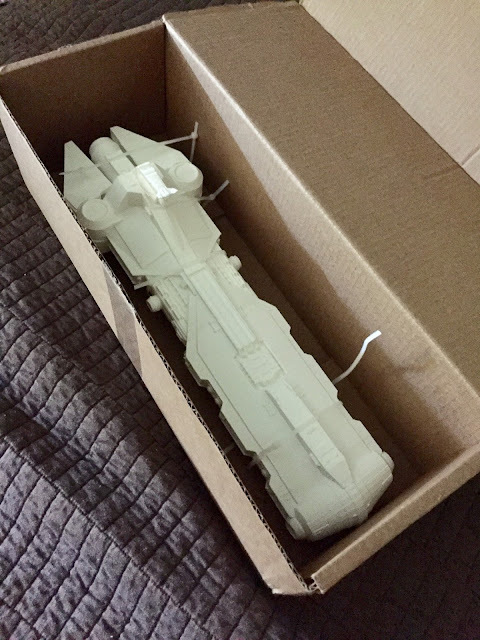 What I might do is bore into her docking bays and put in base bits so I can dock A-wings and other star fighters. The engine sections also hinge open, but the chunk holding them on is verrrrrrry solidly glued on, and I'd be hesitant about digging it off. I had messaged them before about whether they had an unassembled one, but alas, no answer. I'll need to put some basing parts in as well, so I'll be checking Corsec and Litko. I wonder if I can finish the rest of the 11 Deathwatch and their Corvus Darkstar before the basing stuff comes? They're technically my third batch after the initial set of 10 marines from way back, not to mention the recent Overkill set. Well, fourth, because I painted up Artemis and two other bits-box veterans to experiment with greys (how much and highlighting). I'll post those next time. Well, anyway, Terminators. I do love working on Terminators. 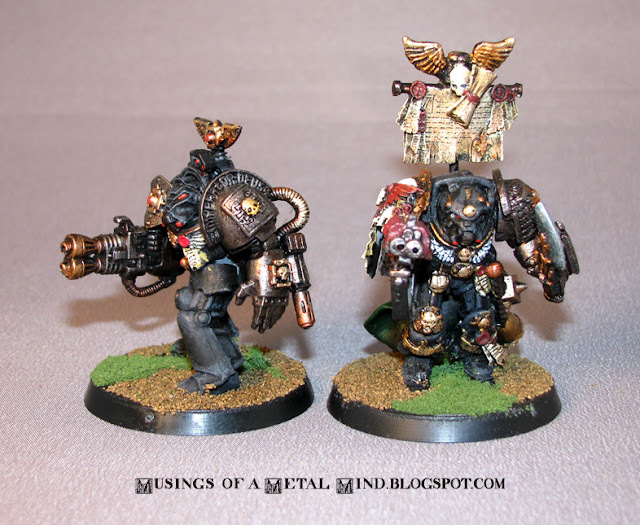 What I really like about painting Deathwatch stuff is that it allows you to use all of those chapter-specific bits that sit around for ages, and since they're all basically unique, the army gains a lot of character rapidly. The downside is that since they're covered in detail your speed slows down dramatically, but oh well. 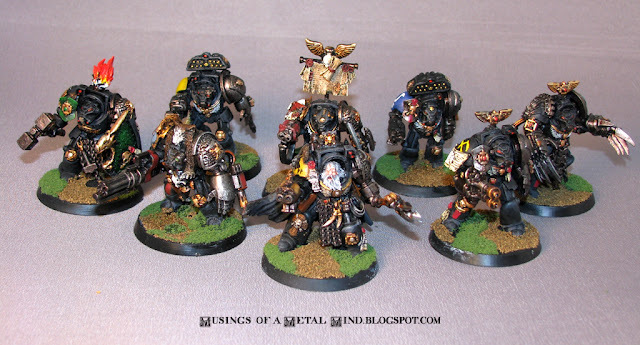 I've since taken to painting the Deathwatch in smaller groups (Kill Teams, if you will) with this one being probably the largest batch. 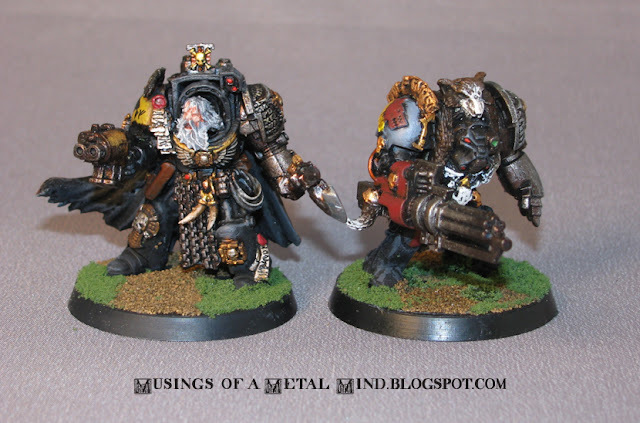 Einar here (right) joined the DW along with his brothers, the assault cannon-toting Wolf Guard Thorvald (left) and the regular armored Svein (you'll meet him later). 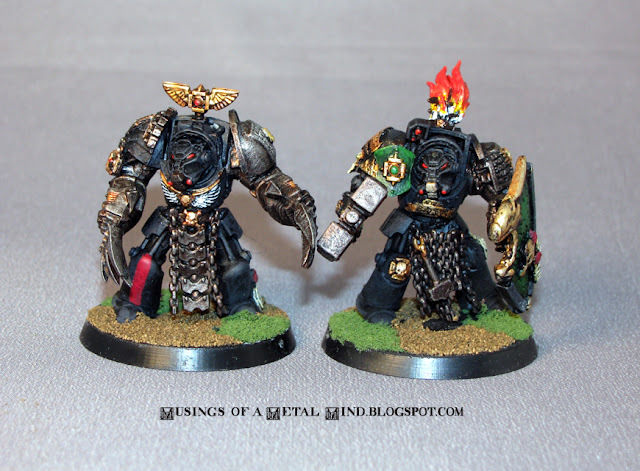 Would you believe I found a set of Space Wolf terminator pads after I finished these guys? Yeah. I'm rather proud of how Thorvald's melt-fist came out. That bit is courtesy of the Calth set, as I gave those sergeants combi-plasmas. Einar's frost axe got a new bluish metallic treatment I'm trying out. It involves mixing blue airbrush paint with mythril silver at the mid-stage, which is then highlighted with silver. I used the same technique on Artemis' sword and Svein's axe, and I rather like it. Whether I'll use it on the other power weapons.... well, maybe, maybe not. It seems rather specialised to the Space Wolf frost weaponry (or other like specials) to me. Epistolary Astinus of the Deathwing (left) bears Litanies of Hatred on a back-mast that came with a Bugman model. I like the new Librarian models, but this had been sitting in a bits lot for some time. 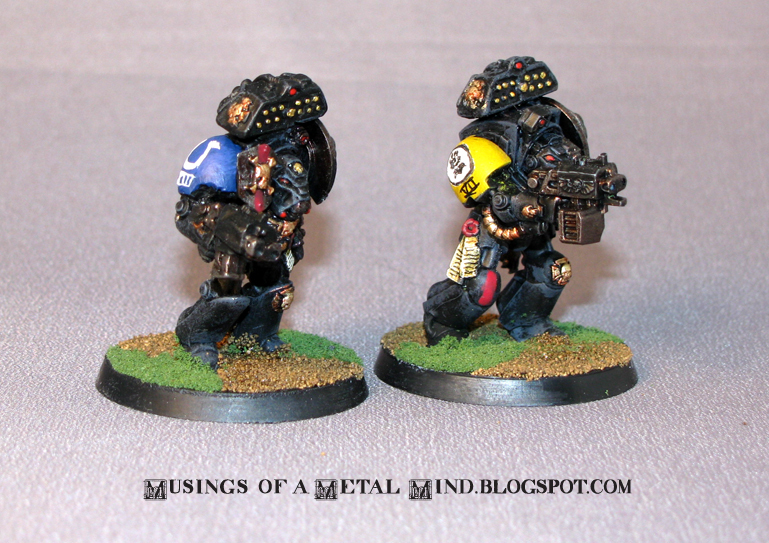 This way my Deathwatch also has a little psychic firepower, to boot. Brother Dagmar of the Emperor's Scythes echoes the combat loadout of Branatar; a heavy flamer and a melta-fist (courtesy of the Calth combi-bits). I decided on the Scythes after reading a bit of their background, which details them being nearly wiped out by who else but the Tyranids (their homeworld was entirely lost). If anybody knew how to fight the malignant cockroaches (not to mention having an axe to grind) it'd be a Scythe. The background material I found doesn't say whether they carried any actual scythes, though. I guess the Death Guard have the lock on those. Brothers Claudio and Siegmeyer of the Ultramarines and Imperial Fists snagged some old cyclone launchers on their way to life. I prefer these to the newer big-box launchers, which are more dreadnaught than termie-sized. As I was out of chainfists, they each gained a custom bits box one (chainswords are plentiful). 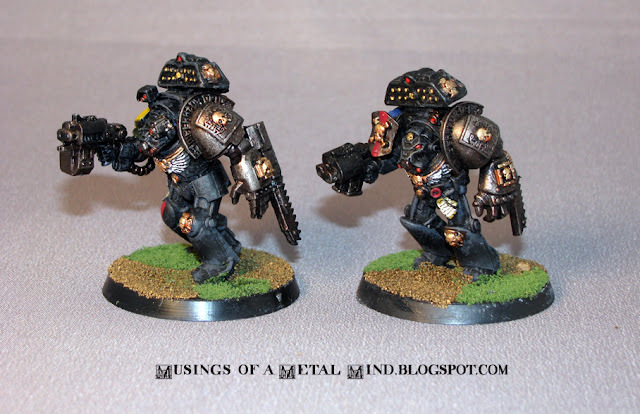 Brother Fulgis of the Salamanders came about solely because I had that Storm Shield in my bits box forever. Also, I liked Branatar's back-torch and wanted to replicate it with another terminator. 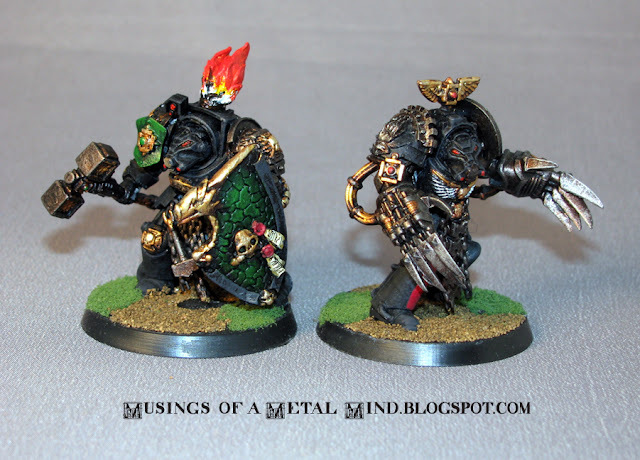 Brother Seknar of the Iron Hands has those big, unshielded lightning claws from the Assassinorum Chaos Lord sprue. I thought their exposed workings were especially Iron Hands-y, so I ordered a FW shoulder pad to go with them (along with Fulgis' FW Salamander one). The fiery-gold effect on the Salamander logo was made by building up through the gold-ish metallics range and highlighting with Auric Gold mixed with Mythril Silver. I'm rather proud of the way these two turned out. I think they're my favorites out of the bunch. Next up, their power-armored brethren, in waves-- oh crap I just found another metal Terminator. Oh well. Plenty of spares. Next time, some regular grunts. Well, this is lovely. I can't get photos to load using the conventional Blogger tool, I have to go three steps around to Google photos. (have a better solution? Drop me a line) God help me. 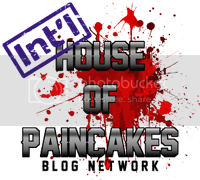 At least they're (mostly) watermarked, and if you ever want to see any golden oldies, they're on my hard drive somewhere. 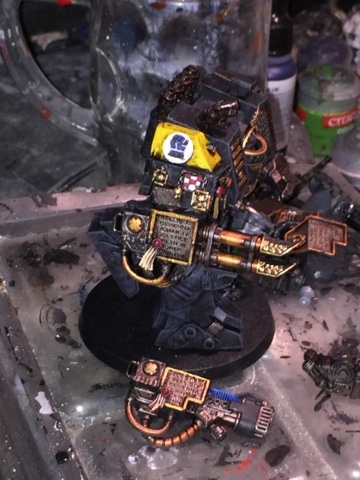 Anyway, thanks to being ill, I managed to finish Venerable Brother Antilocus early, which means I can get back to painting the rest of his Deathwatch Brethren. He ended up being rather large, and turning into a bit of a vignette piece, as you can see. Under all those bits is the old Contemptor Multi-Melta arm, which gained a magnet so I could swap weapons in and out. This required a bit of cutting, but it was all worthwhile. I debated scatchbuilding (or just buying) a set of Stormcannon and Melta-Lance and/or siege drill arms (especially since the Imperial Fists are into sieges) but decided to stay with the standard kit for the time being. His alternate weapon options, magnetized to click into place when needed. They also add an extra degree of posability. My apologies for the photo hotspots. Should've turned the model slightly more (sigh). I always thought the articulated hand made the boxy dread look rather apelike, but now that he has proper legs, it's wonderful. I debated using the arms from the Votoms kit the legs came from, but finding adequate cauldrons proved daunting, and the test fitting looked a little contrived. His back is a little underwhelming. I didn't want to overdo the gold everywhere. Yes, I know, there are parts lines on his legs. Shame on me for not green stuffing and sanding. I blame the diverticulitis. Large bases demand something extra, I think. This Grot is hoping Antilocus will just pass him by without stomping on him but you can guess what's going to happen next. The little fellow came with a Grenadier Models orc or ogre (I forget which), and sharp eyes will recognize the plastic bit from the Assassinorum set (they didn't want your shiny new Callidus to get cover saves). The two bits fit together quite well, so instead of using him for an objective marker, I plugged them in here to (literally) give the model a little character. For some reason Blogger isn't uploading my JPEGs. Anyone else having issues? ....who's about to punt some poor snotling into next week. Not sure I like how his chest armor is turning out, though. What do you all think? My apologies for the deep shadow; rest assured there's nothing especially interesting going on in his waist area; just a run of the mill extra long scroll. Once it's all painted I'll light it better, but these photos really are just to show progress. I didn't do much to the back because frankly, I didn't think it needed it. Those mold lines could do with some sanding down, I suppose. I though of doing some rivets to the back of the cobbled-together right arm, but then, he's not especially rivet-heavy. 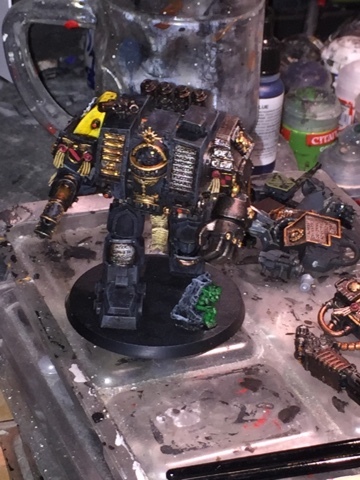 Speaking of that arm, it started life as a Contemptor multi-melta arm from the Calth boxed set. Of course, it didn't match the left arm from the standard dread kit, so I built it up with the sawed-off top of the lascannon and some plasticard. 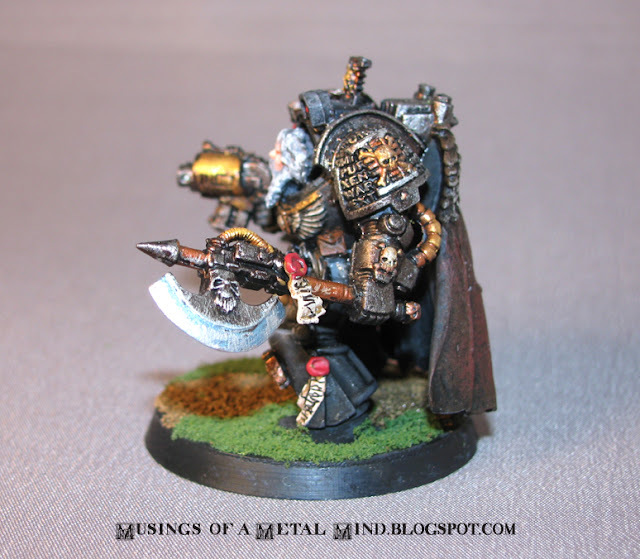 The weapons are all magnetized, of course, but here's what I consider his "main" one. Canonically the DW dread has a plasma cannon but of course, canonically he's not an almost-Leviathan either. 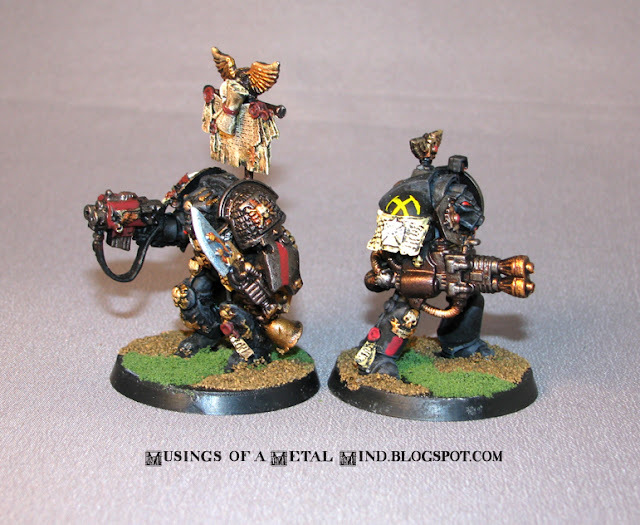 Nihilius' canonical weapon in the DW boxed set, but of course, this Dread isn't Nihilius. I should give him a name and a "home" Space Marine Chapter. What do you think, folks, does he look like an Imperial Fist? A Dark Angel? A Blood Angel? Those are the icons I have from a drop pod kit, by the way. 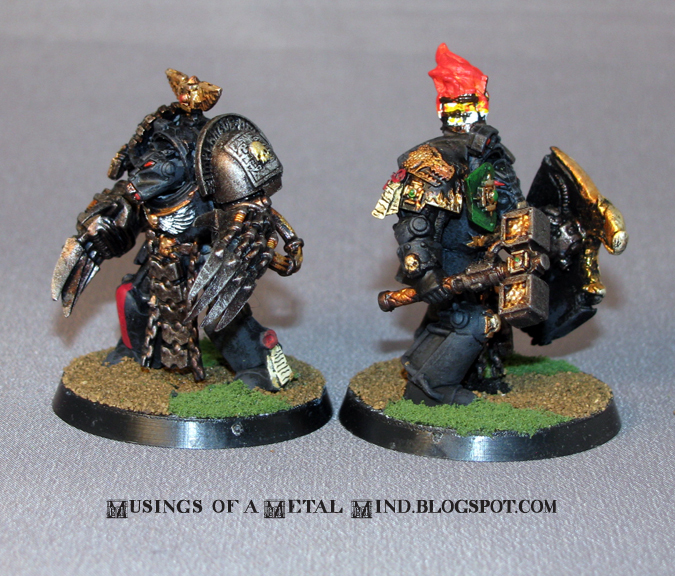 I have a Space Wolf icon as well, but he lacks the Fenrisian ornamentation. Anyway, I have enough Space Wolves among the Deathwatch rank-n-file. Pics of those are coming soon, but the DW infantry has been sidelined while I work on this fellow. The multi-melta from the Contemptor arm. Underwhelming, isn't it? I might just buy a set of actual Leviathan weapons (oooh, that stormcannon) but they might be too huge for this kit. I didn't do the assault cannon because frankly, it's just too little gun for this beast. A Contemptor-sized one, maybe. 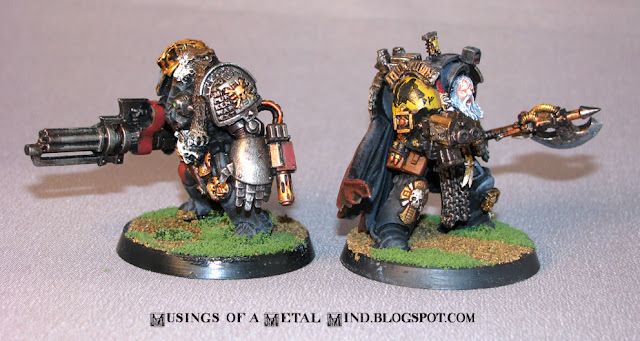 Is anyone else surprised that the DW dreads didn't get twin-linked shot cannons, especially considering their infantry can carry loads of them? Even the Blood Angels dread sports one. I also noticed you can't buy "Rifleman" dreads with two twin-linked autocannons or lascannons, either, and certainly not AA "Mortis" variants with their radar arrays. That DW codex was very rushed and not well thought out. Here's his left arm, by the way. Nothing really to see here. They could've gone the extra mile and made a special Deathwatch shoulder pad for it, but they didn't, more's the pity. Both arms are removable and semo-posable, so in the future I might fit him with a different loadout, but we'll see. Some sanding, finishing, and painting to come this week. (I think I'm kind of ahead of schedule, now).